Can an apartment cut health care costs of homeless 'super users'? Can an apartment cut health care costs of homeless ‘super users’? Pajo with the key to her home. For most of her adult life, Pajo had a pattern. “The first two things I usually do when I move into a town is find out where the nearest bus stop is and where the nearest heroin dealer is,” she said. Then she got to New Haven in 2011, after four years in prison, halfway houses and sober houses, and something changed. To this day, she’s never learned where to find heroin in the Elm City. Her desire to be sober was stronger than wanting to be high, she says. She went back to work as a chef, this time in a French restaurant. But that’s not when things got better. Instead, she developed a severe form of pneumonia that left her in the hospital multiple times, and unable to work. She became homeless and ended up in a shelter. At one point, she had a seizure and fell on her arm. The weight of her body cut off blood flow the muscles, which began releasing toxins into her blood. No one found her for two days. During one of her hospitalizations, the staff began looking for her next of kin. She survived, but Pajo, 47, has no illusions about what could have happened. Going back to a shelter would have meant having to get up at 5 a.m. and finding some place to go during the day, something she was too sick to do. Except for one thing – an experiment. Unbeknownst to her, Pajo’s experiences put her at the intersection of two massive, complex systems undergoing significant change. Her medical problems made her one of the state’s highest-cost Medicaid clients. Losing her housing brought her into a system that has, in recent years, been operating on the premise that homelessness is a problem that can be solved with the right approach to housing, not just managed by opening shelters. And Pajo’s homelessness and health problems coincided with a major effort to link the housing and health care systems. Connecticut is one of four sites for a five-year demonstration program designed to identify high-cost, high-need patients – “super users,” as they’re commonly called in health care – who are also homeless, and match them with both a place to live and a team to help with things like making sure they pay rent, get a primary care doctor, and get care. The program, known formally as Connecticut Integrated Healthcare and Housing Neighborhoods, is funded and administered by a wide group of federal, state and private organizations. Among the questions it’s intended to answer: Can the combination of housing and support help “super users” improve their lives, boost their health – and reduce their health care spending? If it works, is there a way to sustain it when the grant funds run out? And can it lead to better connections between health care and housing, two complex systems with enormous bearing on one another, that haven’t traditionally worked together? Connecticut spends just over $8,000 per year, on average, for each Medicaid client (a portion of that is reimbursed by the federal government). But among those in the demonstration program, the costs had been far higher – an average of $73,000 per year. The bulk of the costs covered hospitalization and emergency room visits. 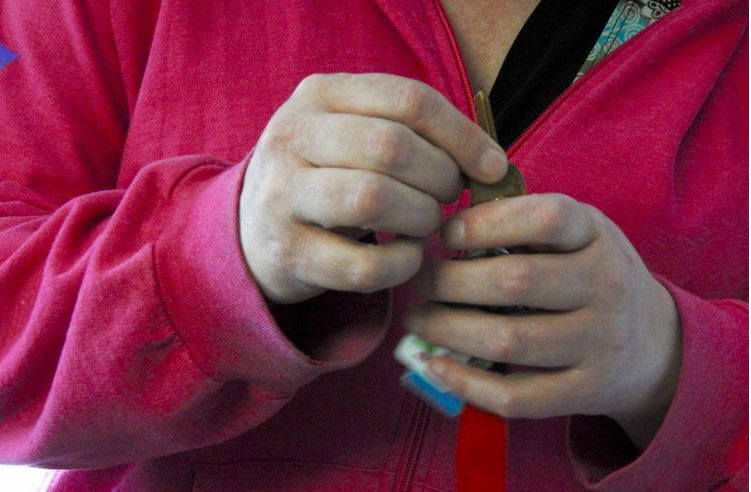 Now in the fourth year, the program has housed 168 people in Connecticut. Ninety-eight percent have at least one chronic health condition such as diabetes, hypertension or asthma, and two-thirds also have both a mental health disorder and problems with drugs or alcohol. Nearly one in four had been homeless or in a shelter for at least four years. Forty-three percent had at least one psychiatric hospitalization in the past year. Twenty-four percent had reported feeling depressed or sad every day for the past month. Data on changes in participants’ health care costs – which will be compared to those of people who didn’t participate, as part of a randomized control study – are not yet available. But early results suggest participants are using fewer crisis health care services and more routine care. In the 12 months after clients got housing, the average number of overnight hospital stays fell from 8.5 to 2.7, and emergency room visits fell from 13 to 4.9. Ninety percent of program participants now have a primary care provider, 91 percent get mental health care, and 89 percent see specialists. The percentage using the emergency room as their main source of care fell from 44 percent to 13 percent. Ninety-two percent said their quality of life had improved. In one hospital’s experience, when a person gets into stable housing, his or her emergency room visits drop by an average of 80 percent. Other efforts have found similar results. 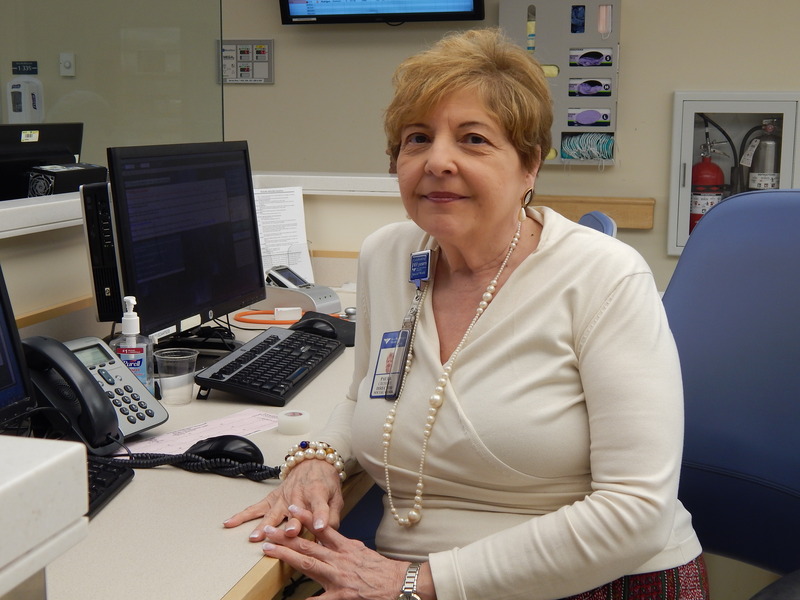 Middlesex Hospital is one of many Connecticut hospitals using a “community care team” of mental health, medical and social service providers to better coordinate ways to meet the needs of frequent emergency room patients. Dr. Michael Saxe, the hospital’s emergency medicine chairman, said housing is a particularly powerful intervention: When a person gets into stable housing, his or her emergency room visits drop by an average of 80 percent. For her, the program has meant not only having a deeply subsidized home – participants must pay 30 percent of their income toward rent – but a team of people to help, whether it’s going with her to medical appointments or troubleshooting problems that could otherwise morph into overwhelming situations. But the grant funding runs out at the end of next year, and those involved are looking for ways to sustain the program. Many, including state officials, are eyeing Medicaid as a way to pay for supports such as case management and patient navigation, if data can demonstrate that the approach saves money. “Our vision for this is, now that we’re really seeing these great outcomes with this original  people, how do we now scale this and really root supportive housing as a health care intervention, and have it really integrated into our state policy moving forward?” said Sarah Gallagher, director of strategic initiatives for CSH, a national organization focused on housing as a key strategy to improve vulnerable people’s lives. CSH is leading the demonstration program, which has sites in Los Angeles, San Francisco, Michigan and Connecticut. It’s funded by a Social Innovation Fund grant from the federal Corporation for National & Community Service, with matching money from national and local foundations. Connecticut’s inclusion was the result of efforts coordinated by the Partnership for Strong Communities, and it’s now being overseen by AIDS Connecticut, and run by local organizations in New Haven, New London, Hartford and Fairfield County. Gov. Dannel P. Malloy, whose administration has made affordable and supportive housing a major priority, gave the program 150 state rental assistance vouchers, which pay 70 percent of participants’ rent, and will continue beyond the end of the grant period. Why does housing matter for health? As Alison Cunningham tells it, it’s because being on the street or in shelters is like a minefield that sets back recovery. Cunningham is the executive director of Columbus House, the New Haven shelter where Pajo was staying before she became part of the program. Say you leave the hospital with plans for a visiting nurse to bring you medications. If you’re staying in a shelter – most don’t let people stay during the day – the nurse might arrive with no way to find you. Or you leave the hospital with your prescription filled. It’s not uncommon, Cunningham says, for people to sell the medication for money to buy a sandwich or to pay someone to let them sleep on their couch. Or maybe you keep the medication and sleep on a park bench and someone takes your bag – with the meds, your ID, the follow-up care plan from the hospital, your clothes and everything else you own. It’s like taking one step forward – “I feel great, I just left the hospital” – and six steps back – “I just can’t get traction to stay stable” – Cunningham says. If you have a place to live, by contrast, the visiting nurse shows up and delivers your medication and takes your pulse. “The person’s stress of living on that park bench has disappeared,” Cunningham said. The idea that housing could be the launching point for stability and improved health – and not the result of it – is hardly new to those who work in housing. The concept even has a shorthand: “Million-Dollar Murray,” the title of a 2006 New Yorker article by Malcolm Gladwell about a homeless Nevada man who racked up astronomical medical bills cycling in and out of emergency rooms, alcohol treatment and other care. The article focused on the idea that it would be more effective, and cheaper for the government, to get chronically homeless people like Murray a place to live and support. 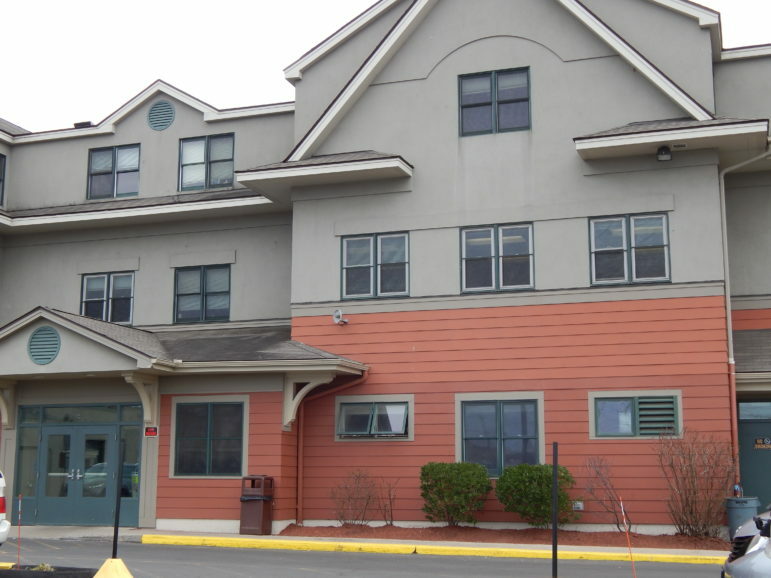 “The problem that we’ve always had is, with the old systems that we had in homelessness, we really didn’t have a way to get at those folks,” said Steve DiLella, director of the individual and family support program unit at the Connecticut Department of Housing. In other words, the Murrays were out there. But how to tell who they were? The program Pajo is part of is built in part on answering that question. Homeless shelters and outreach organizations in Connecticut are now required to enter data on those they serve into an electronic system (with the individual’s consent). 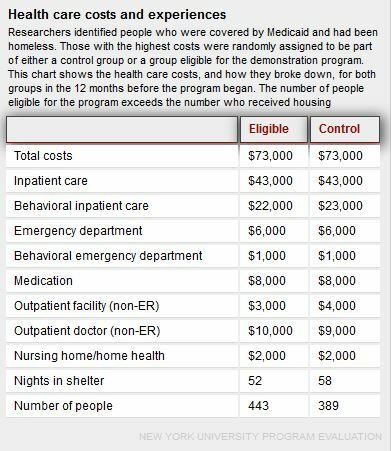 That allowed the demonstration program to find the “Murrays”: The homeless data was matched with Medicaid data to identify those with the highest costs. But finding the frequent users wasn’t the only barrier. Traditionally, the homeless and health care systems haven’t been well connected. “They use a different language,” said John Merz, AIDS Connecticut’s executive director. Some, like Gallagher, see the program as a way to figure out how the two systems could complement one another. While the health care system generally responds to those who come into the office or hospital, she noted, those who work with the homeless are more accustomed to going out and finding people. And working together can help those in both systems get a broader sense of their shared clients, said Alicia Woodsby, executive director of the Partnership for Strong Communities. If you’d asked Crombie – Yale-New Haven Hospital’s social work director – a few years ago, she’d have told you she had a pretty good handle on which patients were homeless. Then she saw the results of a study of the hospital’s homeless patients. 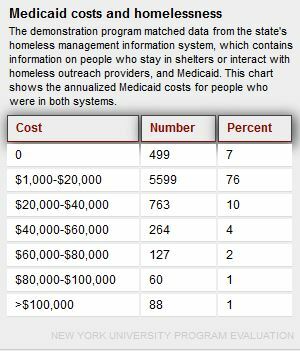 It found that the vast majority of homeless patients – 80 to 85 percent – are covered by Medicaid. They move around a lot and might fall off a medical provider’s radar screen until they have a crisis. And compared to other adults with Medicaid, they tend to be more likely to use the emergency room, get readmitted to the hospital after being discharged, and stay longer when they’re there. “Those three elements, they have a significant impact on hospitals and health care,” Crombie said. Starting, it turned out, with the hospital. To Crombie’s surprise, the study revealed that about 30 percent of the time, the hospital was failing to identify if a patient was homeless at all. An answer lay in how staff asked patients questions. “That may sound like a pretty simple thing, you ask somebody if they’re homeless and they tell you,” Crombie said. But many don’t. People are often embarrassed to admit they are homeless, or fearful it will affect their care, she said. So Crombie and her staff worked with registration and admission staff, doctors, nurses and social workers to change the questions. Instead of “Are you homeless?” they pushed for more subtle queries: Where will you go to recuperate? Where were you last night? Do you need a safe place to stay? Asking a returning patient what happened since they got out of the hospital and if they were able to recover has another benefit, Crombie said. “Right away you’re getting at a different level and you’re building a different relationship with the patient,” she said. But they also worried: Even if we identify a patient as homeless, what could we do about it? At Yale-New Haven, there’s now a protocol for homeless patients. Information on their housing status is included in the hospital’s electronic medical record, and each is assigned a social worker, who assesses the person’s needs and how they can best be addressed. In most cases, Crombie said, patients who are homeless don’t have a standard source of medical care outside the emergency room. They only go to the ER in crisis. And they might leave the hospital at 3 a.m., when social services agencies aren’t open, making it hard to connect the patient with other types of services. Still, New Haven also has a tool that most places don’t: For patients who need a place to recover and don’t have one, there is now a section of Columbus House, referred to as a respite program, where they can stay. They don’t have to leave during the day the way people usually do in a shelter. They can get intensive case management and follow-up care there. It’s helped to dramatically cut down the time homeless patients stay in the hospital while recovering, and cut the number of emergency room visits after getting out by more than half. And it provides time to work on getting the patient into housing – something Crombie said is critical to making it work in the long run. But key to that is having an adequate supply of housing, and that’s still a challenge, in Connecticut and across the country. 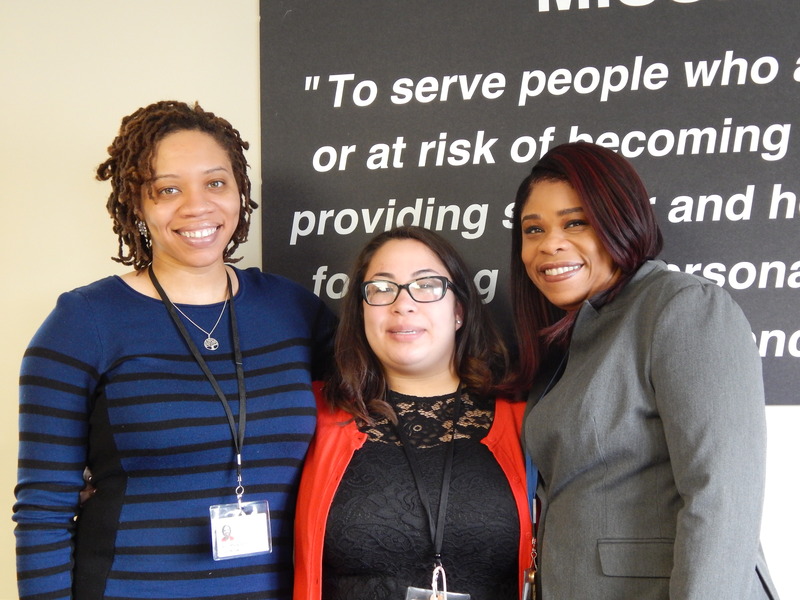 Pajo’s support team, from left: case manager Ann-Marie White and patient navigators Alyssa Eckstein, and Takisha Highsmith. Cunningham tells a story from the early days of Columbus House’s involvement in supportive housing, long before the current program, about a man who came to the shelter regularly. He never told them his name. Soon after settling in, he would have a grand mal seizure. He would go to the hospital in an ambulance. And at some point, maybe even that same day, he would come back to the shelter, and it would happen all over again. Some time later, after he had stopped going to the shelter, a case manager tracked him down to see if he wanted to participate in a supportive housing program. Other people had approached him about similar programs in the past, but he never agreed. This time, he did. He got housing, and connected to regular medical care. He began taking medication regularly and stopped having seizures. He got a job and played in a band. He reconnected with his family, which had reported him dead because it had been so long since they’d heard from him. When Cunningham later asked the man why he’d finally agreed to try the housing, he said it was the woman who reached out to him. She’d done it repeatedly, kept sitting with him and talking to him, until he realized he could trust her. To Cunningham, it shows two things: Housing is a vital part of health care. But perhaps more critically, she says, a man who never told the shelter his name, who had been offered an apartment in the past but never took it, developed a relationship and trust with someone. “We can make all the policy changes we want, but unless you have somebody that knows how to work with people, you can throw those policies out the window,” Cunningham said. To Pajo, too, the key is the relationships. Her team includes Alyssa Eckstein and Takisha Highsmith, patient navigators who help coordinate care for Pajo and other clients. They help them land appointments and go with them, translating the terms doctors use and breaking things down so they’re understandable. There’s also Ann-Marie White, a case manager whose responsibilities extend to just about anything that isn’t medical. For some clients, that means helping to search for apartments and gather a security deposit. It means helping them maintain the apartment and buy groceries, pay bills and get to the Department of Social Services to sign up for benefits. Gallagher calls them the glue between all the different systems clients encounter. When Pajo first got an apartment, she was so weak she needed a nurse to come help her shower. Without the team, there would have been no way she would have been able to get groceries, she said. They helped her with doctor’s appointments. They were troubleshooters as she worked to regain her health and build a sense of stability. There was the time White took her to the grocery store in the middle of a blizzard to make sure she had food in her house. Or the many times her ride to physical therapy didn’t show up. “I have called them, tears in my eyes, ‘My medical cab didn’t pick me up, I’m going to miss PT,’ and they were always there,” Pajo said. She never missed an appointment. Some days, she left physical therapy almost in tears. “And Alyssa would say in her sweet kind voice, ‘Yes, but you’re getting better,’” Pajo said. Supports are key, Highsmith said. Some clients need help remembering to pay their rent. Some need someone to talk to, to help tackle problems that might otherwise become overwhelming. “To put someone in housing that has failed before and to think because they’re housed it’s going to work this time without certain supports is really setting them up again to fail,” she said. Dawn Lambert, an official at the state Department of Social Services who is leading multiple efforts aimed at changing how care is delivered, sees stable housing as about more than medical stability. To her, it’s also a starting point for employment and meaningfully participating in the community. The next question for those involved in the program is what happens when the grant funding runs out, after next year. Gallagher, Merz and others are hoping Medicaid – which is partially funded by the federal government – can fill the gap. It can’t pay for housing, but it can fund supports such as case management and patient navigator services. The demonstration program is aimed in part at determining what services it takes to make things work, and what their cost impact is. Because the housing subsidy itself costs about $7,500 to $8,000 per year, officials are hoping the savings from reduced use of costly medical services can at least offset that, Lambert said. During the holidays, Pajo volunteered at a soup kitchen. She plans to begin working part-time at another soup kitchen. “I worked in five-star restaurants, and I worked in soup kitchens, and I’d rather work in a soup kitchen,” she said – it’s more fulfilling. She has progressed enough that she became the medical conservator for an ill friend. The first year out of the shelter, she and a few others in the program were single, so Pajo got them together. “We had a big Thanksgiving dinner at my house,” she said.